“Fun, fresh, and witty, Intro to Alien Invasion is somehow both a hilarious send-up and a heartfelt, unfettered celebration of the genre." “Intro to Alien Invasion smuggles a sly, affectionate portrait of today’s train wreck college campus culture inside a fast-paced alien invasion saga. I couldn’t stop reading it!" — Patton Oswalt, "New York Times" bestselling author of "Silver Screen Fiend"
"How exactly do you write a hilarious B-movie alien invasion comic that somehow still contains a genuine love story? Put it in the hands of Owen King, Mark Jude Poirier, and Nancy Ahn, that's how. Intro to Alien Invasion is a hell of a lot of fun, plus it's kind of disgusting. Talk about a damn good time." — Victor Lavalle, author of "Big Machine" and "The Devil in Silver"
— Stacey Richter, award-winning author of "Twin Study" and "My Date with Satan"
"Told with energy and a subversive charm somewhere between Edgar Wright and Eli Roth.... An enjoyablyirreverent diversion." "Full of fun, scares and the perfect amount of exploding alien goop." — Matthew Diffee, "New Yorker" cartoonist and author of "Hand Drawn Jokes for Smart Attractive People"
A highly successful spoof of B-list monster movies, this story ticks all the boxes: horny college students, damsels in distress, megalomaniac evildoers, and aliens that are simultaneously cheesy and convincing...Campy sci-fi fun." 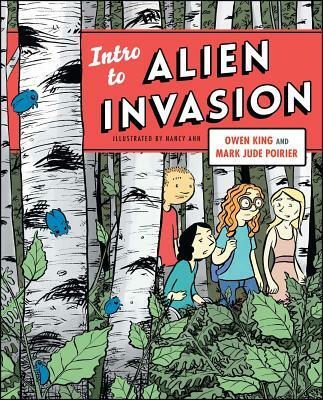 "Fun and acerbic, yet poignant....Intro to Alien Invasion is a graphic novel that deserves a place on any dorm room table." "Aliens crunch and the dialogue pops in this hilarious, hip graphic novel by a troika of pop culture mavens...Destined to be a cult classic at a campus near you." "[A] hilarious send-up of college life." "Very funny...will appeal to a lot people, like fans of “The Simpsons” and “Adventure Time."